It is a period of civil war. We know the main characters, the heroes, the villains. Although I've created a whole squadron of fighter pilots, in the stories I focus primarily on my former RPG character and his wingman to a slightly lesser extent. In my online Star Wars interactions, I generally have user id's relating to either my character's callsign of Thumper (see Cracian Thumper, not Bambi-Thumper) or his squadron designation, Corona Nine. These stories are posted for the enjoyment (hopefully) of those who stumble across them and take the time to read them. The Star Wars universe belongs to LucasFilm, and I'm not making any profit off of this (quite the opposite, really). I'll leave the big characters alone and just play in the corner of this amazing galaxy by myself, okay? co ro na. n., pl. -nas or -nae. 1. The highest-temperature region of the Sun's outer atmosphere. 2. The only part of the Sun visible during a total eclipse. see HALO. The Coronas are an X-wing starfighter squadron active in the time roughly between the Battle of Yavin and the Battle of Hoth. There are no canon movie characters in the squadron, no relatives of canon characters, nothing like that--it's just a group of ordinary pilots working together to help the Rebellion. They have their own quirks, their own qualities and their own adventures, which I've been trying to chronicle for several years now. Some of those stories are listed below. Most of these stories build on previous ones. While my hope is that they could be read independently of each other, there are some where something significant could be lost if the reader doesn't have the assumed background knowledge from another story. For that reason, I'm including a "Recommended Reading" field for those stories. I consider all of these stories to be rated a strong PG under the American movie rating system guidelines. These are organized into different categories. This first group is my main storyline so far. The "Additional Stories" and "OC Challenges" below are still considered Corona Canon but are typically meant more as supplemental stories and vignettes with a general focus on characterization and background information. Constructive feedback on stories is most welcome, or even a note to say you read any of them. If you e-mail me, please put an appropriate subject line on the e-mail so I won't accidentally delete it as spam. Note: A timeline showing the integrated chronological order of all of these stories and their approximate time frame relative to the Battle of Yavin is available here. Chronologically, this is the first Corona story with Darin (my primary character). Think of it as a television show's pilot episode (no pun intended): it introduces all the pilots as it follows Darin during his first days with the Coronas and on his very first combat mission. It takes place about two months after the Battle of Yavin. This is a small scene taken out of its overall context whose sole purpose is to describe the various ships in Crescent Star's fleet. It was meant to be incorporated into the story "Outside Looking In", but I decided it would be best if I only summarized this scene in there and left this extended version as a separate document. This detailed information is useful in subsequent stories, and I wanted to make it easily available. It takes place two days after "Commencement", or four days after Darin joined the Coronas. OLI starts two days after "Commencement" ends, and it completes most of the introductory information started in "Commencement". Darin has to learn how to adjust to his new lifestyle with the Coronas onboard Crescent Star while the events from his first combat mission are still fresh in his mind. "No Good Reason". OLI sequel, in-work. See "Projects" section. This takes place a week after "Handle." Feuding astromechs, a series of computer glitches, and rookie mistakes complicate Darin's life in his new squadron. This was an Essential OC challenge entry (more info on that in the "Additional Stories" section below). The challenge was, "You can't bring me down! Let your character be happy and satisfied for a change. Then, make the worst happen, but, as the challenge states, for whichever reasons it does not bring him down. He's still happy after all is said and done. We can't bring them down, but it won't be for lack of trying." This takes place about two months after Darin joins the Coronas, and while it doesn't compare to the bad stuff I put him through before he joined the Rebellion, Darin is still the victim in this story. Quiver persuades him to participate in a prank on a squadmate. Another light piece that takes place when Darin is still pretty new to the squadron. Quiver and CC force Darin into taking a thumper ride while they're on R&R. A Trio vignette highlighting one evening when they have a bit too much to drink at the Bacta Tank. It will be helpful for a reader to already know very basic background info of the Coronas as there is no introductory information in this story. "Untitled". Story taking place ~5 months after "Commencement". In-work. See "Projects" section. Admittedly an experiment in writing on my part, but one I had fun with nonetheless. This takes place about six months after "Commencement". On a Rebel world, the Coronas help look for an Imperial pilot who was shot down. This story is told in nothing but first-person point-of-view, which may either make it horribly confusing to readers or somewhat more interesting. If you read it, let me know which it is. This story will be rewritten in the future, though the basic plot will likely remain the same. This story takes place a month after "Searching and Finding". The Coronas spend some time on a Rebel safeworld, and Darin and one other character must reexamine their relationships between their family and their squadmates. This is a very character-driven story. This takes place about eight months after "Commencement". The Imperials set a trap for the Rebels on an isolated colony world, which strands the Coronas on the planet while the Imperials hunt for them. I posted Revision A (9/04, 71 pages) on the JC Forums as a stand-alone story, where it was also reviewed in the Fan Fiction Newsletter in March 2004. Ground is the beginning of a plot arc during that particular stretch of time and is my favorite story. If a person was to only read one story of mine ever, this is the one I would ask him or her to read. NOTE: Revision C is considerably different (and, in my opinion, much better) in some areas from Revs. A or B. Waters is the direct sequel to "Solid Ground", and its Prologue begins on the night of the Epilogue in Ground (Rev. B/C). The Coronas must deal with the aftermath and consequences of the events on Lokinha, both at a personal level and at higher, more official levels. I've removed the links to Rev. A since Waters will be going into an overhaul now to accommodate the changes made to Rev. C of "Solid Ground" that waterfall down. I'm not sure when Rev. B of Waters will be finished. "Going to Pieces", sequel to "Muddy Waters" and story arc continuation. In-work. See "Projects" section. I have a large collection of scene snippets, character snapshots, and so on. My original intention in writing these was to one day include each in a larger story; however, I now see that some wouldn't fit well in a larger story for reasons of plots, timelines, etc. This file is made up of a few of these blurbs. They are not connected to each other, most have no specific timeframe in mind (when there is, it's noted), and they are very much a snapshot: they're abrupt, sometimes with no beginning or ending, no setup, no descriptions. As such they might not be easy reads, but I wanted to include them as an option here because of the characterization they provide. I do consider these to be Corona "canon", taking place in the background of the squadron between stories, and the characterization carries through to the rest of my stories. Each blurb has its date of last revision next to its header. We explore a part of Darin's childhood here. Darin is seven when his sister Shiori is born. A few weeks after she comes home for the first time, Darin is still having trouble adjusting to the newcomer to the household. Another look into Darin's past. Darin is twelve years old, and he'd give anything to make his five-year-old sister leave him alone. What happens with Shiori at a local park catches him by surprise. Darin is now seventeen years old, and his whole life is turning upside down and forcing changes on him that he never would have dreamed could happen. Though some significant events remain the same, Revision F has been completely rewritten from previous versions and tells what I hope is a more realistic (if considerably darker) story. This is not a Corona story or even a Rebel story, but it may tie in with them on a tangent down the road. It's a story about an Imperial TIE Pilot stationed on Craci IV after the Imperial occupation and the life-changing event he experiences. This is part of the "OC Project" in the Essential Guide to OCs thread on the TF.N boards. Special Features (including the aim of the OC Project, the creation of this story, outtakes and more) can be found on the last page of the offsite HTML link. While it didn't win, this story was nominated for Best Drama and Best Male Original Character (Chase Barton) in the Summer 2008 Saga Era Fanfic Awards on the TF.N boards. This was my entry in response to the JC Fan Fiction Boards Valentine's Day Love Letter Challenge. No one from Corona Squadron is in it, but one of the Quakes is. The challenge was as follows: "Write a love letter written to someone or a story about a love letter. The word limit is 2000 words and your story must be one-post." This particular entry takes place sometime before "Solid Ground". This is a short vignette focusing on a Rebel Fleet Trooper on the Tantive IV. No Coronas were harmed in the making of this story. Here's my response for the JC Fan Fiction Boards Downtime Pilot thread's Challenge #2, "Memorial". It takes place shortly before ESB, immediately after the Battle of Derra IV, and it is about Luke, Rogue Flight, Soontir Fel and the 181st Fighter Group. No Coronas are involved in this. This is a vignette I wrote in response to the Calendar Challenge on the JC Fan Fiction Boards. A squad of Rebel Fleet Troopers embark on a ship boarding mission to steal supplies. No Coronas were harmed in the making of this story. The story is being continued each month as part of the challenge. Only the first three months' worth are written and posted since the challenge was temporarily put on hold during the JC board move and then postponed after the move was complete. After his parents' deaths on the Gus Treta station, young Wedge Antilles tries to find a new direction in life. This story focuses on Wedge but includes Booster Terrik and Mirax Terrik. It's my entry for the JC Fan Fiction Boards' 2013 Dear Diary Challenge, and as such is written in a first-person POV diary format. It was updated twice a month and was completed in December 2013. In the JC Fanfic Boards' Winter 2014 awards, it was nominated for Best Canon story and Best Canon Character Interpretation for Wedge. On the JC Fan Fiction Boards, I enjoy participating in the Essential OC (Original Character) thread. This thread has regularly scheduled challenges that are open to any story featuring original characters. Each challenge is different, and I have written several stories for them (list below). "Turnaround" is also included, listed above. The challenge reads, "Between a Rock and a Hard Place. Create a scenario that puts one or more of your OCs into a situation in which a choice must be made between two options. The options are mutually exclusive, and either choice would produce an undesirable outcome for the OC(s)." This entry takes place sometime before "Solid Ground", probably before "Metal Coils" too, and Botch gets the limelight. The challenge: "'Everyone has a price.' Does the old saying hold true for your OC? Offer them a bribe to do something that they would otherwise find reprehensible, and let us all find out! And remember, often a person's 'price' has nothing to do with money..." The summary for my entry is simply that not every Rebel is a good guy. Pellicer is the main character. I wrote and posted this story within 24 hours because I was quickly approaching the challenge deadline, and there are lots of rough spots and hiccups that I'd love to fix now. It takes place before "Solid Ground". The challenge reads, "More Than Meets The Eye... Your OC is about to make a shocking discovery. The object/person/droid they have seen everyday for years is going to turn out to be something very different from first impressions. Is their fiance actually an underworld hitman? Is their hairy, burly partner in crime really a ballet dancer? Is their airspeeder really a 40-foot robot? Whatever the case may be, will your OC like this sudden change...or will they hate it?" Here, a scientist learns a secret about something he cares about. No Coronas were harmed in the writing of this story, but I did have fun playing around on Treminal III, Mackin's homeworld. The main character, Milin Ba'hon, was nominated for Best Non-Human in the 2008 Saga Era Fanfic Awards on the TF.N boards. The challenge: "When you’re a child anything can make you happy: ice cream, a trip to the grocery store, running with scissors. For adults it’s a bit more complicated. With stress and worries beating down on you, it takes something really exciting to cause that happy, giddy, lighter-than-air, run around and break stuff happiness. So lock up the good china, and give your adult OC something to smile about." I actually had to be nice to my characters. In this story, Darin copes with job burnout. The challenge: "Hero Worship! Everyone looks up to someone, and your OC gets the chance to take a closer look at his/her hero. Does the hero measure up? Does your OC notice if s/he doesn't? Does your OC turn into a creepy stalker? Inquiring minds want to know." I didn't stick very closely to the challenge's intent, but the basics are there. My summary for this story featuring the Mackins is, "A military family deals with a member's secret deployment in different ways. Introspective piece." I could very well be the only person weird enough to write a character study story about a tauntaun. The challenge: "SNOW WARS: The Bitter Cold of Battle; Inspired by Thorny’s love for The Empire Strikes Back. Have an OC participate in the Battle of Hoth, or some other similar snowy battlefield, it can be canon or one of your own creations. FYI: Thorn didn't specify if your OC had to be a combatant, or that they belonged to either side; so let's leave that one open to interpretation." Summary: A tauntaun’s life is changed by the Battle of Hoth. The challenge: "OC’s Need to Eat their Viggies to Get Big & Strong: Side story, background story, adventures in finding a restroom story… Tell a story about one of your current OC’s, give a little expose on your favorite, or not-so-favorite OC. No more than one post long!" I took this opportunity to delve a bit more into Lt. Weas's character, and this vignette takes place shortly before "Commencement". The challenge: "The Worst Day of Your Life. Write about the worst day of a character's life. If the character has experienced more than one "worst day", pick the one that has impacted their life the most. The "worst day" doesn't have to be the standard tragic fare. It could be something that is really silly but awful to the character." This story shows us Mackin's worst day, when he had to leave his family because his squadron was being loaned to the Rebellion. Pre-Coronas. This page has information on some of the important planets I use in the stories, as well as a note regarding my approach to canon relating to Craci IV in light of the release of The Essential Atlas. This page contains sketches, photographs, and music titles associated with Corona Squadron. 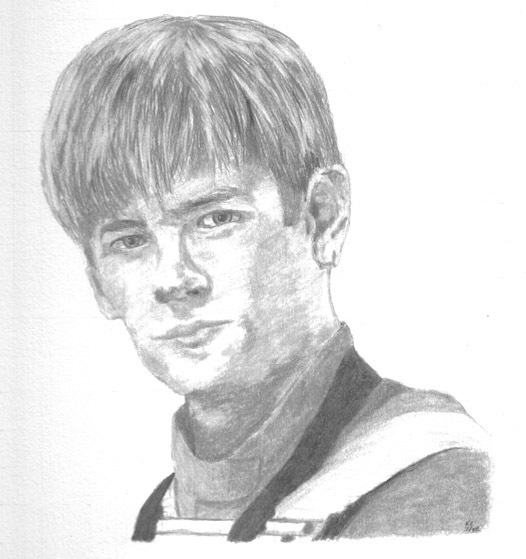 Completed individual portrait sketches like the one of Darin to the left are on that pilot's bio page, found above. * Just Finished/Posted: "Up in Flames", TFN boards 2013 Diary Challenge with young Wedge Antilles. Completed 12/31/13, uploaded PDF 2/7/14. * Just Finished/Posted: "Nothing Good in Goodbye", a new vignette. Uploaded 7/19/13. * In-work: Corona Blurb Anthology. * In-work: "No Good Reason", the next sequential story after "Outside Looking In". 10% complete as of 2/7/14. * In-work: New revision (B) of "Muddy Waters". 60% complete as of 2/7/14. Was my winning 2012 NaNo Project but was unfinished and needs some rewriting. * On hold: "Going to Pieces", a "Muddy Waters" sequel and continuation of the Ground/Waters story arc. This was my (winning) project for NaNoWriMo (username chrononaut67). 75% complete as of 3/20/11. On hold until new rev of Muddy Waters is finished. * In-work: Character list of key personnel in Crescent Star's fleet. 10% complete as of 3/20/11. * On partial hold: "Trip Around the Sun", a story about Mackin in his pre- and early Rebellion timeframe. This was my project for the 2009 NaNoWriMo. 20% complete as of 1/1/11. * On partial hold: "Evasive Maneuvers", a story with a droid focus on the first small mission Darin's personally in charge of. This was my project for the 2011 NaNo. 5% complete as of 1/26/12. * On hold: Untitled story set five months after "Commencement". 25% complete. * Future Project: New revision (B) of "Searching and Finding". * Future Project: New revision (D) of "How to Handle Yourself". 2/7/14: Uploaded PDF document of "Up in Flames". Added new sketch "Lost in Work" to drawings page. 7/19/13: Uploaded PDF document of "Nothing Good in Goodbye". Added offsite link to ongoing story "Up in Flames". 9/23/12: Uploaded PDF documents of every story and removed their RTF, DOC and HTML files. Updated links to the JC Forums after their move and URL changes. 9/16/12: Uploaded PDF documents of "The Storm After the Calm" and "Finders Keepers". Added some offsite HTML link notices due to truncation issue on the new JC Forums. 5/10/12: Uploaded a portrait sketch of Pellicer to his bio page. Uploaded the latest version of Prologue and Chapter One (subject to some minor modifications) within the RTF file of "Solid Ground". 1/26/12. Swapped the corrupted "Fleet Description" Word document file with a Rich Text Format version. Posted offsite HTML link for "Finders Keepers". "So we've been outnumbered / raided and now cornered. / It's hard to fight when the fight ain't fair. / We're getting stronger now / find things they never found. / They might be bigger / but we're faster and never scared. / You can walk away, say we don't need this / but there's something in your eyes says we can beat this. / Because these things will change. / Can you feel it now? / These walls that they put up to hold us back will fall down. / This revolution, the time will come / for us to finally win. / We sing hallelujah, we sing hallelujah. / Tonight we'll stand, get off our knees / fight for what we've worked for all these years. / And the battle was long, it's the fight of our lives..." - Taylor Swift, "Change"
This page last updated February 7, 2014.